Since the 1990’s the city has been experiencing double-digit growth, reaching 32,066 population by mid 2018. As a natural suburban growth market of the MSA to the North, Colorado Springs, the city is part of the Fountain Valley which is comprised of both unincorporated El Paso County and City of Fountain, thus reaching 97,100 population. Fountain dominates the commercial corridors of the greater Fountain Valley populous; thus we are the location for businesses to locate to service the Valley. Commercial development naturally follows housing development. Through the Great Recession, the city continued to experience a housing boom, realizing 298 new houses built and 5 new commercial developments on average. At the beginning of 2017, there were approximately 2,500 new unit housing development project submitted through city Planning. Learn more about our growth, by viewing the Housing Development Map. The city’s Mesa Ridge commercial activity corridor amasses one of the largest concentrations of home income wealth levels throughout the Pikes Peak region (approx. $74,000). With our community segment profiles concentrated in "Up and Coming Families" and "Middleburg" populous segments; reflective of an average age of 32 and active wage-earner lifestyles. 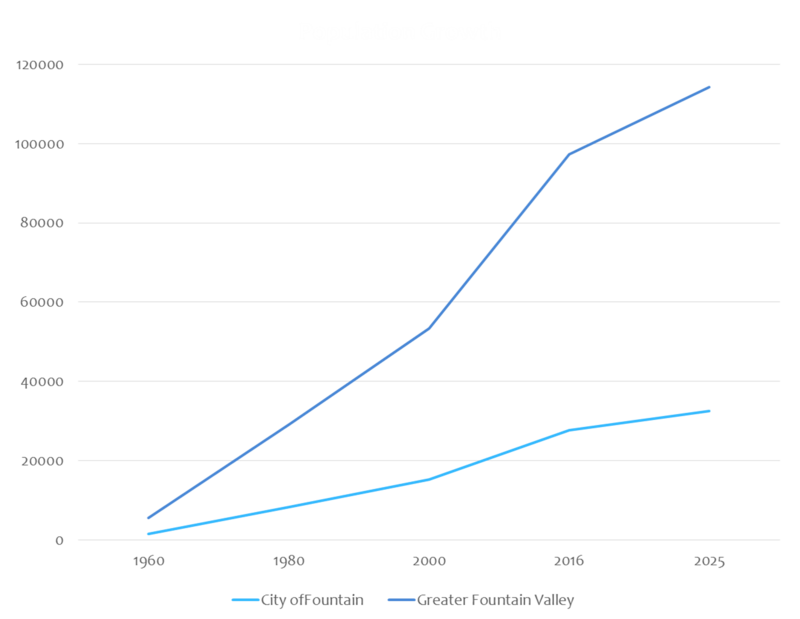 By the year 2050, a 51,300 population has been forecasted for the City of Fountain and respective growth for the greater Fountain Valley, Pikes Peak region, and Front-Range CO corridor. This means a continuing great opportunity for business development and lifestyle services needs of the community. Please visit our Retail Section to learn more about activity and data on Fountain's marketplace.